It’s nice to have a few time-tested items in your arsenal that you can simply order brand new every few years with full confidence in what you’re going to receive. No shopping around, no sizing up or deliberating over various products, you just know. Well, this shoe is that piece of gear for me, and my fourth pair just arrived in the mail yesterday. I’ve had two or three pairs of these shoes over the last several years and I’ve used them for just about everything from walking around town, hiking 14ers, easy 5th class climbing and many days scrambling around talus fields chasing the latest bouldering project. They stick like glue to rock, they can take a ton of abuse and they last for a long time1. 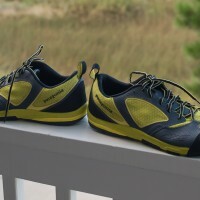 A look at the new Rover shoes from Patagonia as well as an opportunity for you to win a free pair! Welcome to the Hood[1. WTTH from here on out] is the second offering, after the well-received The Schengen Files, from Paul Robinson and Alex Kahn’s PRAK Media. WTTH follows Robinson, Daniel Woods, Guntram Jörg and Anthony Gullsten to various European hotspots. And much like The Schengen Files, WTTH was more or less filmed, edited and packaged for sale by the climbers themselves. Since climbing movie reviews are notoriously difficult to write, I will try to keep this pretty simple. A Fine Line follows the likes of Jimmy Webb, Brion Voges, Brad Weaver, Daniel Woods and Dave Graham as they spend a few months doing what they do best, namely doing nothing but bouldering. While ostensibly a “bouldering movie”, A Fine Line is in many ways not your typical bouldering movie.